Liam Agnew isn't likely to be appearing in a Harrogate Town shirt any time soon, but the midfielder insists that he still has a long-term future at Wetherby Road. The 23-year-old ex-Sunderland man departed the CNG Stadium on Friday afternoon to join Spennymoor Town on loan, his third temporary switch in as many months following stints at Boston United and York City. And although he is currently having to look elsewhere to fulfil his need for regular minutes out on the pitch, Agnew is confident of a return to the Town fold. 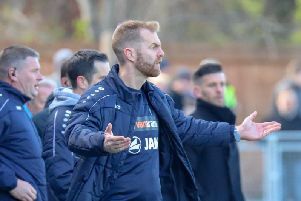 "The team's doing well at the moment, I've not been in the side and after speaking to the gaffer [Simon Weaver] and Thirs [Paul Thirlwell] it didn't look my situation was going to change," he said. "I don't want to sit on the bench, I'm a young player. The only way I'll improve is by playing regular games so that's why I've been keen to go out on loan. "It's more beneficial for me and means I'm still learning every week, and I know the gaffer feels the same. "It can be very tough going out on loan and into a new team where you don't know the players, but I'm feeling sharp and think I've been performing well. "The good thing is that if Town need me then I'm ready to go and Harrogate Town is where I want to be playing. "I 100 per cent see my long-term future as being here, that's why I signed a new contract earlier this season." Agnew has made five starts and seven substitutes appearances for Town in 2018/19, however he had to wait for his chance at the start of the campaign. With both Josh Falkingham and Jack Emmett out injured, he started four consecutive matches in the centre of midfield in September, but then lost his place and has not featured since a 2-0 FA Cup replay loss at Wrexham more than three months ago. "To be fair I had to bide my time at the start of the season and then when I came into midfield alongside Lloyd Kerry we started four games together and won all four," Agnew added. "I felt that I was playing well and that I got better and better with each match and I think the gaffer would agree. "When he made the decision to bring Josh Falkingham back into the side [at home to Leyton Orient on September 22] and leave me out I went and spoke to him. "There wasn't an argument, but we had a discussion about my role in the side. "After that I was rewarded with a new deal and the gaffer has shown that he wants me for the long-term by offering me that new contract. "I want to play for this club in the Football League. That's the aim. Like everyone else here, I'm looking forwards and up, not backwards."